Ok folks, so it’s been a while since I have last made a post on my blog, in fact I have cleared off all of my old posts. I have just recently relocated to the West and felt that my blog needed a fresh start. So to start things back up I’m going to talk about the image above. This image is of a structure that is known as “The Gronk” here in Crested Butte. 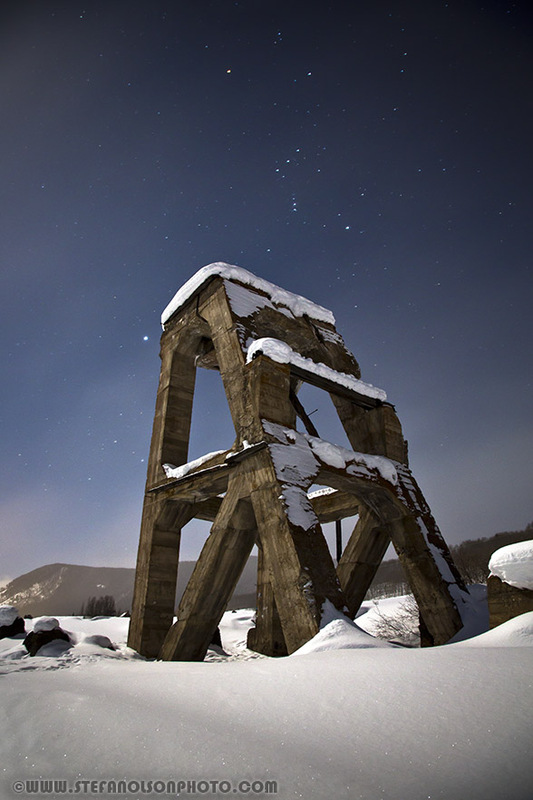 Most people that live here and many that have visited here have seen “The Gronk.” This structure is nothing more than a piece of old mining equipment left over from the mining days of Crested Butte long before it was known for its world class skiing. There is not a whole lot of information about this structure in regards to what its purpose was, but none the less it’s a local land mark and makes for great subject matter in a photo. This image was captured around 9:00 at night after the sun had completely set and the moon was high in the sky. Above the structure you can make out the constellation of Orion. I used a shutter speed of 30 seconds at f/8 and my ISO was set at 800 for this image. I was shooting with my Canon 24-105mm L lens backed all the way out to 24mm mounted on my Canon 5d MkIII. I wanted a wide angle perspective so that I could get a good portion of the night’s sky and, the main subject matter, The Gronk. The conditions were not as ideal as I would have liked but I think the image still came out pretty stellar. There was a very thin cloud layer that was blowing over that night which reflected all the light from town causing the sky to overexpose just a hair and did not allow for the stars to pop as they would on a perfectly clear night. In addition to this shot I also wanted to get a really long exposure of 15 min or so where the stars would streak across the sky but due to the conditions was not able to make that happen. I will need a much clearer night for that type of image. So stay tuned as I will be revisiting this spot and will be working to dial this shot in and get it the way I want it. ~ by stefanolsonphoto on February 24, 2013.